Largemouth Bass can be recognized by the lower jaw which extends past the back edge of the eye. It is dark green above with silvery sides and belly. Orginally, Great Lake and Mississippi River basins; the species is now found throughout North America and the world. (a mix of fresh and saltwater) waters. They like large, slow moving rivers or streams with soft bottoms. Largemouth Bass spawns as early as March or as late as June, depending on water temperature. The males build saucer shaped nests 20 - 30 inches in diameter. The male guards the nest and eggs from all intruders, until the fish hatch. These fish are an extremely popular sport fish. 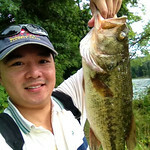 They are excellent fighters when caught on light spinning tackle. Good baits for catching largemouth bass include live minnows, night crawlers, and a variety of artificial lures. Popular methods of fishing are fly-fishing, bait casting, or bottom fishing. This species is considered the most popular sportfish in the United States. For information concerning largemouth bass and their management, please contact Mary Groves at 301-888-2423 or Joseph W Love at 410-260-8257.